…”Yeah yeah, blah de blah Mam. My hair is NOT long see, and if it was, see, you would have to brush it and that would hurt”. Point well said Evie, I’ll concede that one. Posted on March 14, 2011, in Uncategorized and tagged Children, Drawing, Family, Humour, Illustration, Life, Pen and Ink, postaday2011, Sketchbook. Bookmark the permalink. 81 Comments. Your enchanted castle needs what I’ve discovered…it is called the “magic brush,” and it is a beautiful thing! lol, Evie is right! I used to have very long hair as a young girl, and not only did it hurt like crazy having it brushed or put in french braids, but it nearly drowned me in the bathtub! Too much weight for a 50 lb kid. Flashback: “If you don’t comb that huge knot out of your hair, I’m going to cut it off!” A frequent threat from my mom to me years ago, but she never followed through. Congrats on being Freshly Pressed – love your sketch!! that is soooo adorable! And now I know why my Mom kept my hair short when i was a little girl. Well sketched! The drawing reminds me of my old childhood days where me too had those collection of doodles at the back portion of my lecture notebooks. But the tower seemed to be very narrow. Was there still a room left for her hair? HAHA! Sounds like me as a kid. I had hair to my waist and the most sensitive scalp possible. My poor Mom. I did also, my mom ended up getting fed up with me running away from her when she had a brush in her hand, so she just told me I had to take care of it myself. I got my hair cut short 3 days after that. Love it! And congrats on Freshly Pressed! It’s a lovely drawing. Maby you can put a video on how you do it. I think that would be interesting to watch. My mom resorted to simply keeping our hair short. I had a banged pageboy until high school. No wonder I have short(ish…ok fine it IS short) hair. What a fabulous blog! LOVE your illustrations! You are very talented- what a great way to blog about your life… I am inspired! Too true! My sister and I used to always complain about Mom brushing our hair into a bun for ballet class! Tangles were abundant in curly hair! Love your drawings! Hahahaha omg what a wonderful website! I love that pic! Cute little girl went to camp. She had long, curly blond hair. Week 1 – she borrowed some scissors and friends’ help to cut it short – and uneven, of course. My daughter hates having the ‘Tats’ brushed out of her hair. Insists that I’m rubbish at it but ‘mummy does it better’. 🙂 Dad’s are good for somethings but I guess hair brushing aint one of them. AAAAAH I say tats too! My husband looks at me like I’m mad! I can remember saying this to my dad….luckily he’s always had hair as long as mine so he feels my pain! My daughter love to get her hair brushed its her flavor time at night. It seems like every little girl has a problem with brushing their hair and showering. Go figure. LOVE this. I have clear memories of hair brushing wars with my Mom even to this day! Ha ha. This is great. Reminds me of when I was a young’un and had hair just below my waist. The days when I had my hair tied in buns and plaits, they were some painful memories, haha. Still have long hair to this day, but slightly more shorter. Wonderful drawing style you have, really love how you’ve captured the essence of a young girl’s dread of having her hair brushed by mum. Nice Drawing ! This something that all moms and daughters can relate to. I used to hate it when my mom used to comb my hair. I really couldn’t stand it. I would just cry my litte heart out. I would always pout and say to my mom I’ll be glad when I get old enough to do my own hair and my mom would always reply back good I’ll be glad when you’re old enough too. Has anyone been in a situation where it was time to get your hair combed and in the middle of proccess you start to cry and you’re mother, or grandmother would pop you with the comb or bursh to shut up from crying ? Cool but funny picture, Doodlemum. So funny. Not wanting to get a hair cut or brushing reminds me of myself as a little girl. My poor mom. Now I want it short and she doesn’t understand. I’m sure your Rapunzel will want a change someday too. What a sweet painting! The expression of the little girl is wonderfully done. A lot of females can relate to this–as daughters and as mothers. Ah, the price of beauty…! Knowing the hair is going to a kid in need makes me very tolerant of the constant whine when it’s time to comb or brush. Art and family; you do them both so well. Great stuff. Very sweet and cute… just love this one. Very nice!!!! Nice drawing. I love that movie too. I used to hate having my hair brushed. It was thick so it was always SO tuggy. “You can brush it later Mum” I’d always say. Then, my Mum would appear two seconds later with a hair brush.. “Mum I said LATER”.. “Yeah, this IS later!”. Ha ha. I hated my long hair then but I miss it now! I had long golden curls… then my Mum chopped it all (exagguration) off when I was distracted watching Bananas In Pyjamas. Although I don’t know how I didn’t realise what she was doing when I was sitting on the kitchen table with her behind me holding a pair of scissors. 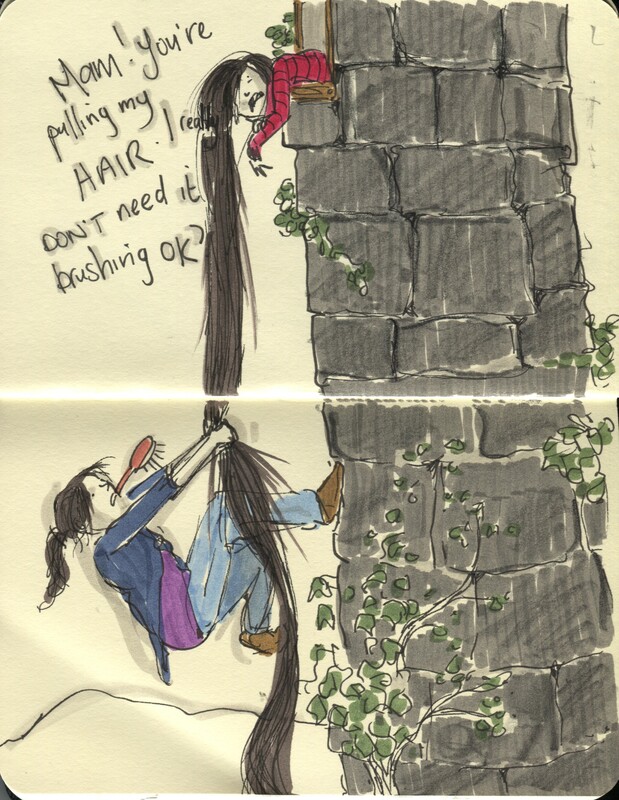 Another hair story : When I was probably younger than the hair-cutting incident, my Mum went to the hairdressers and got her hair cut/permed and we sat in the car waiting, and when she came back I started bawling and yelling and said she wasn’t my mother. I have change issues, obv. Oh this brings back some memories. Havine been blessed (???) with radiculously curly hair I remember my mum having to chase me round the house trying to get it brushed. I have since discovered tangle teaser (this might not be the correct name) from my hairdresser apparently it was on dragon’s Den but didn’t get any money. It’s like a brush that you would use to brush a horse’s mane and goes through my thick curly mop with ease. P.S Congrats on getting freshly pressed. Haha, love it! I had really thick hair once and it would be so hard to brush! Congratz on being FP! Aww, this is adorable! And also TRUE!! I still dislike brushing my hair…but I guess it has to get done. Ha. I love it. I remember screaming sometimes when my mom had to brush knots out of my hair. She called them “rat’s nests”. ew. Fantastic – I may have to show my nursery class this tomorrow. Ah that’s fab! Tell me what they thought! I actually find a weird attraction in women who own long hair hahaha.